A 'monster' great white shark measuring up to 20 ft long is on the prowl off a popular Queensland beach, according to officials. Swimmers were warned to stay out of the water off Stradbroke Island after the shark mauled another smaller great white which had been hooked on a baited drum line. 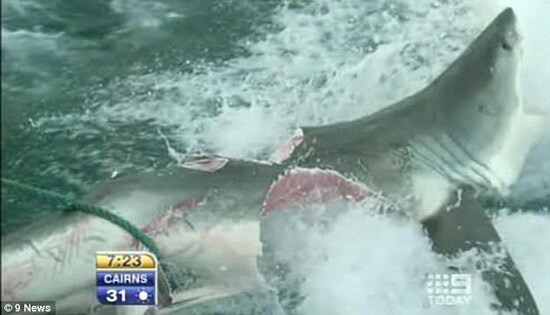 The 10-foot great white was almost bitten in half. The fictional shark at the centre of the Steven Spielberg blockbuster Jaws was estimated to be just five feet longer.